Sunset Through the Longleaf Pine is the original Stone County Mural. 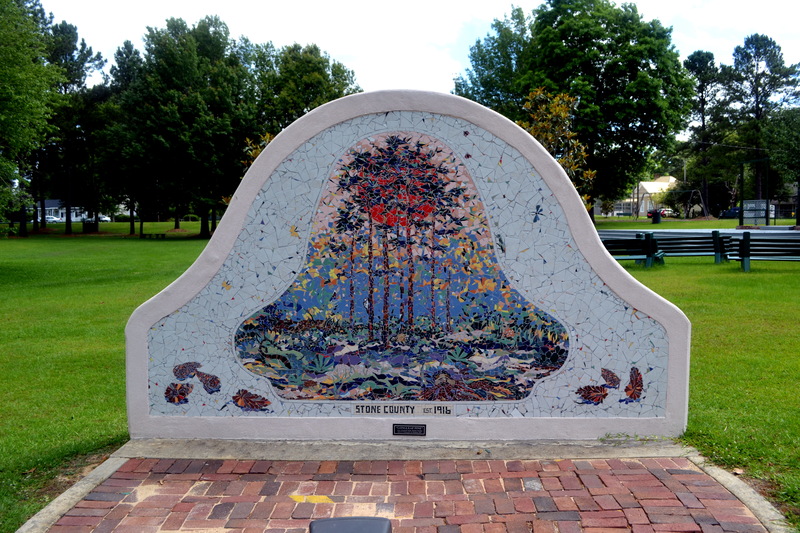 Erected in Blaylock Park in Wiggins facing Pine Street, the mural allows the viewer to see what the pioneers who settled in Mississippi’s virgin pine forests in the early part of the 20th century saw every day. Today, one of the few remaining stands of Longleaf Pines can be seen from the Flint Creek Water Park. The ceramic tiles in this mural were cut by hand. The bricks fronting the mural are some of the original Pine Hill bricks. Mural artists were Elizabeth Veglia and Sandra Cassibry and the art students of the Mississippi Gulf Coast Community College, Perkinston Campus. The mural was dedicated in 2007. Photo is by Cille McHenry Litchfield. Next Next post: Looking for Educational Materials?